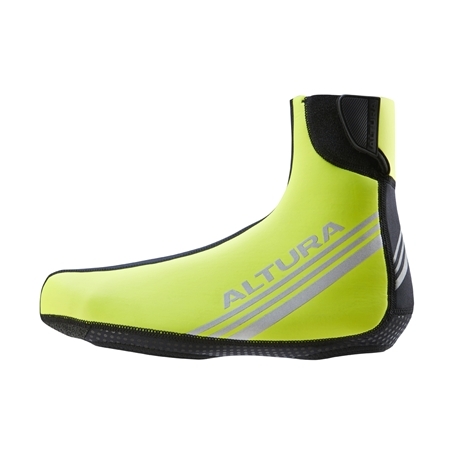 The Altura Thermostretch II overshoes are the ultimate winter riding essential offering water repellency, wind protection and thermal qualities, all wrapped up with high visibility reflective trims. Made with an Altura Shield™ fabric outer to provide protection from wind and water whilst still offering high levels of breathability the Thermostretch II overshoes include an Altura Thermo™ inner using thermosuede fabrics to deliver body warming insulation and warmth and are easily adjustable with a simple Velcro closure. Reflective detailing on the ankle and side of the foot enhances your visibility to other road users making these overshoes ideal for commuting or training in poor light conditions. Very warm, but a little bit bulky. Definitely good for the price. Good value, a snug fit and keeps my expensive shoes from getting wet and equally important my tootsies dry!